The Pterodactyl. Ten-foot wingspan, moving wings and maw, full rotation and voice to greet passersby. 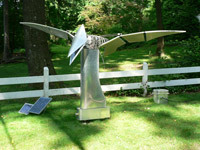 Solar panels charge powerpack which by remote control actuates drive motors. Eats small children and dogs. The Hitchcock is a bird-driven water fountain. 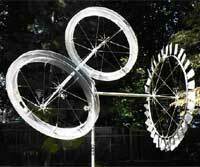 A ten-foot ethereal wheel contains thirty-two feeding stations. Birds continually flying in and out cause wheel rotation. 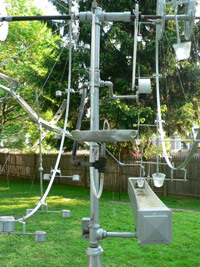 A parallel wheel driven to rotate by the bird wheel carries twelve cups. As rotated thru a trough of water, each cup scoops and carries water up to a reservoir and dumps. The water then flows down into an upwelling flountain. Fountain effluent is piped back to the trough for a continuous circuit. The hitchcock can also be solar-driven by a small motor and chain drive that is actuated by an indoor remote control at my computer work station. 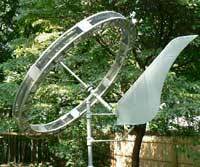 The Swirl-A-Squirrel consists of a cage wheel that is 8 feet in diameter. Tapered roller bearings inside the vertical shaft carry the weight of the assembly and allow rotation in the horizontal plane perpendicular to the vertical shaft. The large sail is fixed to the vertical shaft. This orients the wheel into the wind with the slightest breeze on the sail providing the horizontal rotation. The wheel rotates on roller bearings on the angled shaft that is 45 degrees to the horizontal. Squirrels provide the rotation. Because, in order to access the fuel chamber � the peanuts, the squirrel must enter an access port that is next to the peanuts but separated from the peanuts by a fence. The squirrel must travel around the full circle, grab one peanut, then reverse travel around the circle and exit the port. In its at-rest position the serpentine tube is at 45 degrees to the vertical pole on which it is mounted. The structure is almost balanced top and bottom on the pole. A cylindrical cage at the bottom contains peanuts. Access for the squirrel is at the top of the tube. The squirrel climbs up the vertical pole, the up the tube and into the entrance. 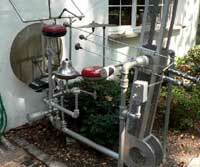 As the squirrel climbs the top section of the tube, the machine begins to rotate. The cage, which had been at the bottom, begins rotation towards the top. When the squirrel reaches the cage, now at the top, the rotation continues and is accelerated It �whips�. This machine is a rectangular tube connecting a cylindrical peanut chamber at the bottom and an eccentric entrance chamber at the top. In its at-rest position, the tube is almost vertical but tilted at a slight angle to the vertical. And the opening in the entrance chamber is offset in the direction of the tilt. The tube is almost balanced top to bottom with the bottom peanut chamber slightly heavier and then even more heavy when loaded with the day�s supply of peanuts. The degree of tilt is set by positioning of counterweights on weight carrying bars. 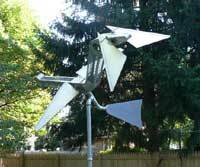 The Squir-Rel-A-Tor is an aluminum and stainless steel fabrication consisting of three large moving wheels. Its principal function is for the entertainment of squirrels and those watching them play. The largest wheel, the drive wheel, is 8� in diameter and mounted on a horizontal shaft which is free to rotate in a 360 degree horizontal plane. It is fitted with thirty-two fan blades which orient the assembly perpendicular to the air current and cause this wheel to rotate in a vertical plane. This sculpture is in the form of the DNA molecule. 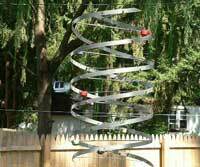 The two coiled stainless steel strands are a double helix. Colored cups connecting the strands replicate the chemical bases. These contain birdseed. It is thirty inches in diameter and six feet in length. Intended to be suspended from a tree and on a very thin stainless steel cable that can barely be seen. This machine is solar-powered and makes one complete revolution every fifteen seconds. 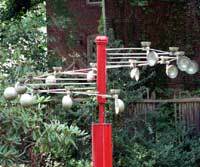 Twelve stainless steel cups attached vertically to The ends of radial rods catch the wind. The rods are stepped on the central axle so that each of the end cups is higher than the cup preceding. The cups rotate in a screw-like plane. Also at the end of the radial rods are another twelve Stainless cups. These carry birdseeds. Wind on the cups causes rotation of the Machine. Action/reaction of the birds taking off and landing also promotes rotation. A merry-go-round of shameless birds.